Bulky, noisy, smoky, so many poor visual impression of the engine, after years of researchand application of new technologies, the status of modern diesel engines has been with the past can not be the same metaphor. 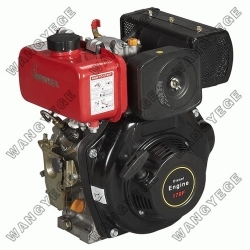 Modern diesel engines generally useelectronically controlled injection, common rail, turbo-cooled technology, the weight, noise,smoke has been a major breakthrough, reaching the level of gasoline. In the diesel enginewith electronically controlled gasoline injection in the main difference is that electronically controlled gasoline injection system is controlled air-fuel ratio (the ratio of fuel and air), while the diesel injection system is electronically controlled by controlling the fuel injectiontime to adjust the size of the load . Diesel Engine Electronic Fuel Injection system consists of sensors, ECU (control unit) and the executive bodies of three parts. Its task is to make electronically controlled fuel injection system to achieve the fuel injection quantity and injection timing with the operating conditions of real-time control. The use of speed, temperature, pressure sensors, real-time detection of parameters simultaneously entered into the computer, stored in the ECU hadto compare parameter values​​, calculated in accordance with the best value afterprocessing the actuator control, drive fuel injection system, the engine operating state the best. For more accurate load regulation, resulting in a common-rail technology. Common rail technology is the high-pressure pumps, pressure sensors and ECU closed-loop system composed of. High-pressure pump high-pressure fuel delivery to the public for the pipeline, through the public for the pipeline to achieve precise control of the oil, cansubstantially reduce the diesel engine oil pressure with engine speed changes. Dieselturbocharger which was introduced. The turbocharged turbocharger technology is that when the fresh air compressed by the middle of the cooler, then through the intake manifold, intake valve flow to the cylinder combustion chamber. Effective in cooling technology can boost the temperature dropped to below 50 ℃, to help reduce emissionsand improve fuel economy. Currently foreign light vehicle diesel engines become more popular, Mercedes-Benz, Volkswagen, BMW, Renault, Volvo and other European brandcars have a diesel engine models.